While my current “workplace” is at home taking care of these three crazy kids, I have put in my fair share of time in more traditional workplace settings. I know all to well how the florescent lights and grey cubicle walls can take their toll on you. I remember how those office chairs can give you all sorts of aches and pains from sitting too long. And of course how I ended up with glasses to help my eyes focus despite having 20/20 vision. My current workplace definitely still gives me aches and pains, and takes a toll on me from time to time. But getting to spend my days reading stories, having tickle wars, and filling endless sippy cups is pretty awesome! And I know it won’t be forever, so I am keeping up with all the ways to stay healthy in the workplace for when I am no longer wiping noses 24/7 and deciphering who’s cry is coming from the other room. 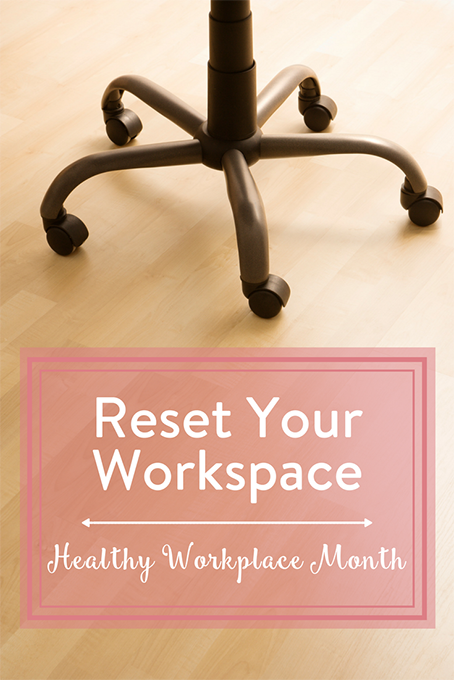 This Healthy Workplace Month, Reset your Workspace! Many of us spend the majority of our waking hours at a job, yet we rarely think about the impact our work environment can have on our well-being. Whether it’s at home, in an office or anywhere in between, there’s always room for improvement. 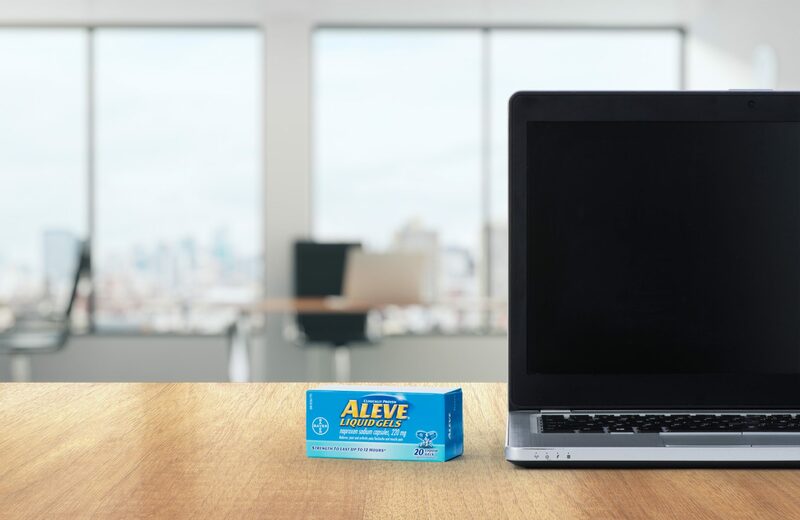 For many of us, a day at work means long hours in front of a computer. According to the Ontario Association of Optometrists, excessive screen time can lead to blurred vision, headaches, tearing or dry and irritated eyes. If you’re feeling the strain, try the 20-20-20 rule: Every 20 minutes, take a 20 second break from your screen and focus on something at least 20 feet away from you. To treat the symptoms of dry eye, keep eye drops handy. 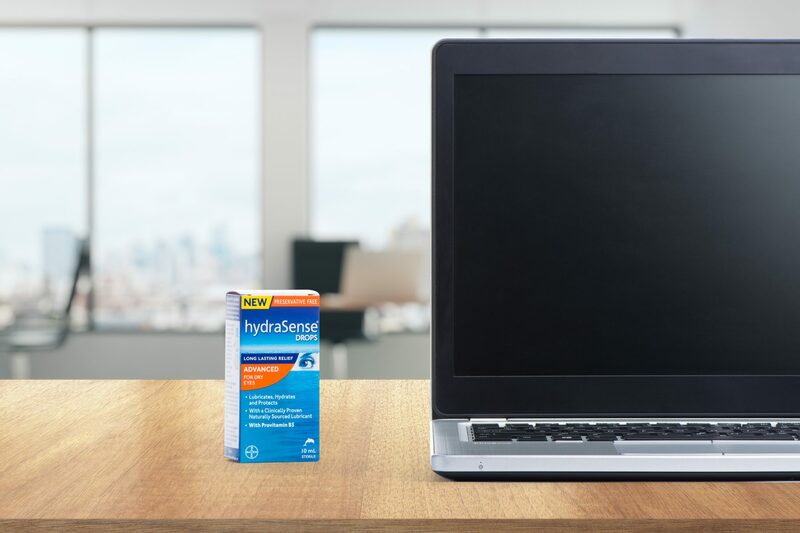 hydraSense® introduced three new products for dry eyes this year that are worth a second look. The eye drops are preservative free and give you long-lasting relief that’s also gentle on the eyes. The colours around us can affect how we think and feel. Try adding a pop of colour to your workspace, even if it’s just a bright picture frame or festive mouse pad. 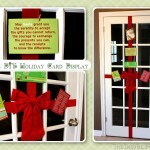 Dressing up your surroundings can help your mind gear up for work, de-stress or bring joy to your day. Breaking up your routine is a great way to clear your head and relieve stress. You may be stuck at work for 8 hours, but you don’t have to take it sitting down! Get up during the day to bounce ideas off of a coworker, take a walking meeting with your team or even get up and do a little dance if you’re feeling brave. If you work from home, a change of scenery may give you new perspective on a tough project. Try hitting a coffee shop or even renting a shared workspace for a few days a week. What can you do this month to encourage a healthy environment where you work? This post is sponsored by Bayer, all opinions are my own. To make sure these products are right for you, always read and follow the label.